Tinkering with Keyboards or Organs? Parts for Sale. 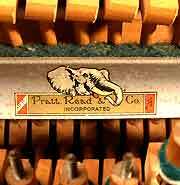 Vintage Keyboard Parts - Repair Vintage Pianos, Organs and Keyboards! 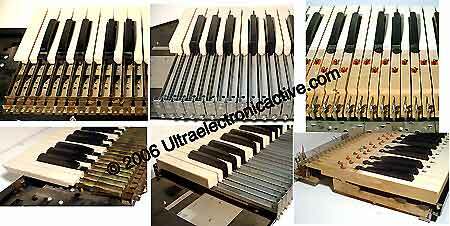 - Custom build Electronic Keyboard Instruments! Here you will find parts for the Do-it-yourselfer and professional to repair or custom build keyboard instruments such as: organs and pianos. 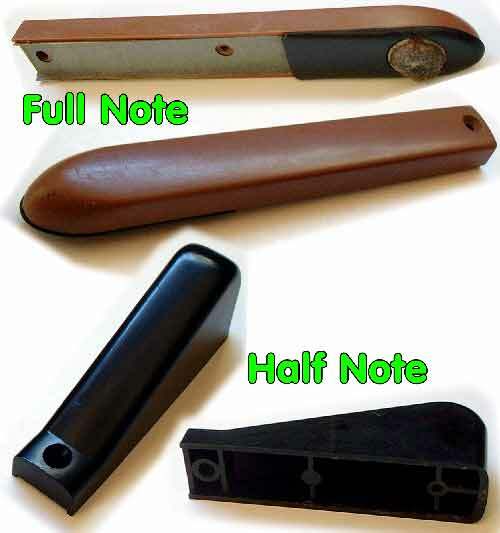 You will find Piano Action parts, Organ keys, whole keyboards, Expression pedals, Sustain / Hold pedals and Bass Pedals. My goal is to provide unique parts to get that old analog piece of gear going again, or to custom Instruments and MIDI controllers! Nice quality wood parts. Sold in form of the complete assembly as shown, for one key each - used, in good working condition and complete. Replace your damaged, cracked, or soiled keys! Get them while still available - this page will be discontinued soon. Each assembly contains a complete set of parts individually packed (see pictures!) , including a wood nut with felts, a hook drop wire, an elbow, a complete wippen, a hammer but, a hammer but rail, a damper lever, a damper flange, the mountign screws, etc. If all parts would be bought separately, these would be easily 5 times of my retail price as below! Buy a whole buch for a discount (see shopping cart below)! 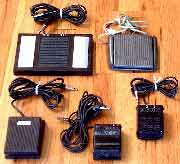 Or by as a wholesale lot: Make money with these parts, if you repair pianos! The keys were pulled in used in good condition. Please specify which notes you need. Keys are availalbe as shown: Left for vintage Conn organs, Middle: for vintage Baldwin organs, Right: - SOLD OUT - NO LONGER AVAILALBE (picture shows: vintage Lowrey organs). item not shown availalbe in addition: Thomas organ keys E-mail for Pictures. Keys are $7 ea. or $19 for 3, or $25 for 5. Purchase with the shopping cart below. Another JPG of Pedal Tops here! Description: If you are restoring or repairing an upright piano with drop action, here is your chance to get the needed parts inexpensively and quickly! This Action was made by Pratt, Read +Co Icorporated - see logo below. There are 4 different damper types in this action. : a damper type for one fat bass string, a dampers for 2 strings, a damper type for 3 strings, and a couple of single dampers that are short. If specific damper types are needed, please indicate. Pratt Reed drop action part kits wholesale lot contains: 16 Low range, 12 upper low range (slightly smaller hammer as "low", action as "low", but different damper), 20 Mid range, and 15 Hi range kits (where 3 of them I labeled High range low, as they provide a damper tab, but no damper was installed in the action. ), which are: 63 kits, plus: I will trow in any extra incomplete action kits, that I have (not counted), usable for parts. If all items in this lot are added up at retail prices for purchasing1 item at the time, as taken form below, that totals: $454.50. This is a wholesale lot expected to sell at a wholesale price. While I am not giving them away: No carefully researched and carefully considered reasinable offer refused. Unreasonable offers, however: ignored! How much would you charge me, if you would take a piano apart, then take its keyboard out and apart, to carefully remove action by action carefully, plus it's surrounding parts, to pack each item with it's screws and parts separately - all for 63 items (! ), then sort out and label each bag, inventory, count, photograph, describe and answer e-mails? So please don't expcet me to do it for less, than what you would charge me! How much do you charge for your piano repairs? My time is as valauble as yours - so please let's not waste it! (Sometimes I just don't know what's up with this country...). Price: $25.00 - 5 Pack. = $5 ea. Price: $20.00 - 3 Pack. Price: $21.00 - 3 Pack. Price: $35.00 - 5 Pack. = $7 ea. Also Check this Analog Drum Machine! Keys for vintage CONN organs (shown on the left in above image) Keys are plastic on metal base with mountign spring. Price: $19.00 - 3 Pack. Keys for vintage THOMAS organs (not shown in above image - E-mail for Pictures ). Description: I have various systain pedals. All provide a 1/4" plug. Some of them provide a custom modification which allows to reverse their function (by means of a toggle switch!) to provie a HOLD functuion usually only found on vintage analog synths. When in reverse: a note will be held after played and when stepping onto the pedal it will be released. This allows for example to put a chord on hold on on esynth while playing on another synth. the 2 pedals in th etop row provide 2 function pedals. Price: $15.00 - $25.00 ea. Do you have synthesizer related information on your web site? --> Join the Analogue Synthesizer Web-Ring!